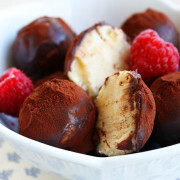 I have never made chocolate truffles before but have always enjoyed them at holiday parties. However, truffles are easy to make in your own home, and they make for a decadent and elegant dessert! When Walker’s Shortbread contacted me recently about sampling some of their delicious, buttery shortbread (it’s a hard life), I jumped at the opportunity and started thinking of how I could incorporate one of the cookies into a recipe. After doing a little searching, and a little experimentation of my own in the kitchen, I came up with these little babies. But, like I said – EASY! So, come on, follow along and I’ll show you the simple steps…. The center is a mixture of ginger shortbread crumbs and cream cheese, which, after mixed together, make a “dough” that is chilled in the fridge. After about 20 minutes, roll the dough into small balls, and set them aside. Now, let’s take our milk chocolate which has been heated and stirred into creamy, dreamy bliss…. Set them on a baking sheet…. Then, set your truffles in the fridge to chill for at least 30 minutes, so the chocolate can harden into a nice, hard shell. You did it! See? Easy. Try these truffles for yourself sometime, or for guests, and prepare to fall to your knees in chocolatey heaven! They’re perfect with a cup of tea as an elegant, after-dinner dessert, or as a sweet treat to share with friends and family this holiday. You can also make them with kids and omit the whiskey. Or, keep the whiskey. Just don’t share. Please enjoy these if you make them, and if you come up with any variations of your own, feel free to share them with me! Oooo! These look decadent!Shortbread anything makes me happy. Hi Rebecca – These absolutely could be made using homemade shortbread! I bet they would taste just as good. Yum…love these! I’m planning to feature something similar (with oreos and peppermint) on my blog next weekend. I always wondered if it could be adapted to use other cookies! Seriously, for never making truffles before, your pictures make you look like a pro. They are beautiful! And I love the idea of a shortbread/cream cheese center! My husband glanced at the screen as I was looking at these … now I am gonna have to run and get the ingredients tmrw, he can’t wait!! I love to make truffles, I usually put them together for friends and neighbors for the holidays, thanks for adding one to my list! These photos are SO beautiful! As soon as the first one popped up on my screen, I mini-gasped, “Oh…I want these.” Yum! Chocolate and whiskey…another absolutely gorgeous and somehow under-rated flavour combination….most people keep using rum. Beautiful photographs! Georgia, those are absolutely gorgeous!! They would make a great Christmas gift for a fellow blogger that lives in Arizona…… I’m just sayin’ :) YUM!!! How many boxes of Walkers do I need to equal 1 cup crushed? oh, also, int he written directions you used the ginger shortbread, but in the list directions it just states shortbread. Have you tried both? Which do you prefer? Just about half of one box will do. You can use either the plain or ginger shortbread, which gives a subtle flavor. Both would be delicious. Oh yum, Georgia! Can we make thses at our house when you come for Christmas? I’ve got the Valrhona cocoa powder! Absolutely! I’ll add it to my list of “requests”… My mom wants cinnamon raisin bread and Lindsay wants carrot cake, haha. Not sure I’ll be able to fit those in, but these are easy enough! I have never made truffles before, but this look absolutely amazing! I am definitely going to give them a try. Thanks so much for sharing. Definitely have never seen shortbread incorporated in a truffle so I definitely give you props for that! And you definitely had me at “whiskey” and “chocolate”!! These sound phenomenal!! Just in time for the holidays. Oh Georgia! You can’t be serious! Y-U-M! Those are the most gorgeous truffles I’ve ever seen! Just beautiful. Did you microwave the chocolate and water together? If so, you shoudn’t have had much of a problem, since when whisked together after being microwaved, the chocolate blends easily. I don’t mind buying Walkers shortbread, but I am wondering if these could be made using homemade shortbread cookies? I’m sure my shortbread-loving friend would love these! These truffles are lovely and looks very delicious. I remember one of my previous co-workers shared a truffle recipe to me back when i was pretty much at this thing. And I made an awful set for my first batch considering it was supposed to be a very easy recipe. Haha. But now I’m getting the hang of it so I’m quite sure I can get this done correctly. I love truffles so much. They are my favourite type of handmade chocolate. they just melt in your mouth! These look fantastic! OH MY goodness!!! I seriously think I’m in love! Those look beyond incredible and soooo delicious. Whiskey + Chocolate?! I can’t stop drooling they look so good. And gorgeous photos too. Oh my goodness. These sound so decadent. I love how easy they are to make too! I had some difficulty with just microwaving the chocolate. next time I will put a bowl over boiling water. It was really hard to get the liquids to mix in the with the chocolate while keeping to a loose consistency that it would cover the balls. You do know shortbread is my favorite right!? When can I be expecting a package of these on my doorstep!? And tell me again, when are you moving this way?? I love making truffles! These ones look so pretty, and I cant believe you used shortbread. What a cool idea!!! I need to try that. WOW, they look so professional like you’ve been doing truffles for years not now for the very first time. love the cheesy filling. thanks for sharing. Well, where is the ginger in the recipe? You said “The center is a mixture of ginger shortbread crumbs and cream cheese” but I don’t see any ginger added. Are there ginger shortbread cookies? I love ginger and can just fake it, but I wonder if you omitted anything. The cookies I used had ginger in them, but any plain butter shortbread will do. Enjoy!